The 1950s began with austerity and ended with affluence. Teenagers listened to American Rock'n'Roll, but Teddy Boys were a British cult. British car makers also took their lead from America and replaced gentle curves with chrome and tail fins. The 1950s though, was a decade of conservative values, as well as Conservative Governments from 1951. In 1950 petrol, sweets, and sugar were rationed. Britain was paying off the debt from the Second World War and needed exports to bring in foreign currency. In spite of economic problems, Clement Atlee's Labour Government had already pushed through an ambitious social programme in the late 1940s. In the 1950s the Welfare State and the National Health Service were a part of people's lives. In 1951 people put their worries aside for a day to visit a huge new attraction staged by the Govenment - the Festival of Britain. 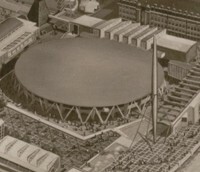 The Festival site had space age buildings, the Skylon and Dome of Discovery (right). It was another world. The Festival's main purpose, was to show contemporary design and to persuade people to buy good design. The public had its first taste of the new style which transformed homes in the 1950s and the 1960s. Economic problems did not last long and by the middle of the 1950s, Britain's economy boomed. Our industries were powering ahead of our European competitors. In 1950 Britain produced 75% of the world's cars. A demand for skilled labour meant high wage packets and a new affluence for working people. The Prime Minister, Harold Macmillan, captured the spirit of the age when he said "Some of our people have never had it so good". Television brought the biggest change to people's lives. In 1950 very few people had a TV set and large areas of the country were not covered by TV transmitters. By 1959 three quarters of the population had access to a set. Other luxuries, such as washing machines and 'fridges, took second place and many people had to wait until the next decade for them. Teenagers with more money to spend started Britian's first youth cult, the Teddy Boys, (there were Teddy Girls as well). Their outlandish style of dress and acts of violence shocked British society. The 1950s was also the decade of American Rock'n'Roll. 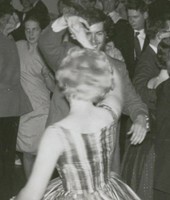 Young people in the latest fashions danced to music despised by their parents. The 1950s brought affluence and more freedoom to many. However, it was still a society in which people left school, got a job, got married and settled down. Few had horizons beyond that. 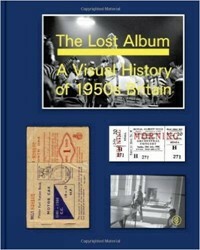 We like 'The Lost Album: A Visual History of 1950s Britain' by Basil Hyman. It is a very accessible and well-illustrated social history of Britain in the 1950s. There are some unique and highly evocative photographs, along with reproduction ration books, tickets and brochures.